While I was at ISTE in June I was fortunate to attend a few ignite sessions. An ignite session is a presentation with some guidelines. In the case of the ones I attended in June each speaker was allowed 20 slides which changed every 15 seconds. Each presentation was only 5 minutes in total. However those 5 minutes are a bit of a pressure cooker with limited room for error. An ignite is very different from doing a regular presentation though because in a regular presentation you control the slides you are sharing. Your slides switch when you want them to switch. You have control so if you want to spend more time on one slide, and less time on another, you can do that. But in an ignite session the rules are laid our for you. One passion, 20 slides, 15 seconds per slide, and GO! My district puts on these really great digital dinner sessions where they bring in a keynote speaker and close to 300 of us learn with them. But before the keynote speaker goes on they like to highlight what is happening in our own district. This year this is happening through ignite sessions. 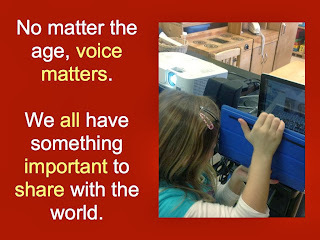 My district would like us to share our passion. We have all been encouraged to share through this ignite format. 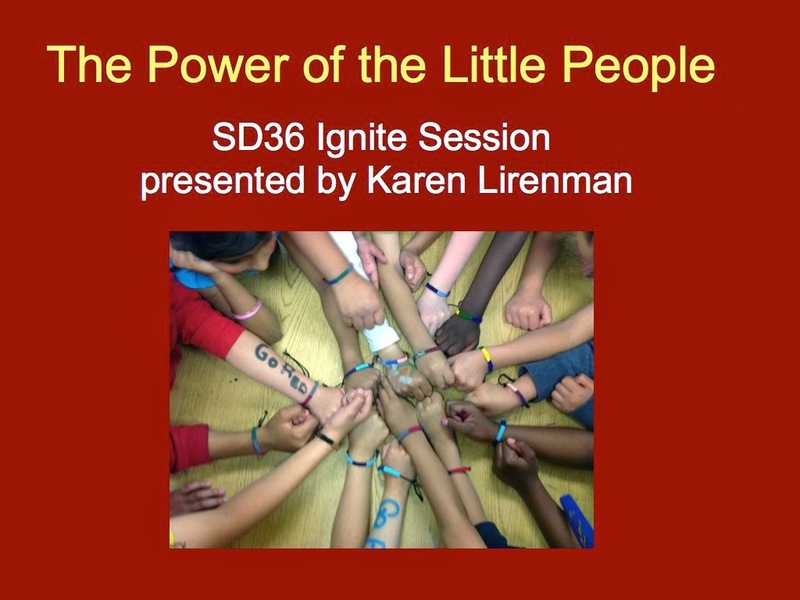 This past Wednesday I took the challenge and created an ignite session on the Power of the Little People - something I'm very passionate about. I tried to show what incredible things my 5, 6, and 7 year olds are capable of doing and while they are cute, they are so much more than cute. It was one of the most frightening things I've done in a while and it most certainly required that I push my personal boundaries. I had to be brave. I think in the end it turned out alright but as I listen back there are several things I would change if I did it again. And the thing is, now that I've done it once, I'd love to do it again. 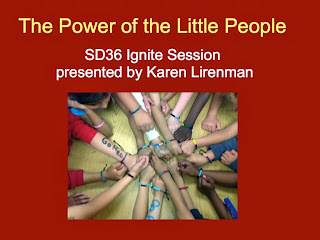 If you're interested in how it turned my ignite session can be found here. It's part of the Dinner Series Ignite - Part 2 and is at the 60 minute mark. I was the fourth of four ignite sessions that evening.